Abstract: Objective To compare the accuracy of MR-ultrashort echo time(UTE) attenuation correction (AC) methods with that of CT AC methods in brain PET examination. Methods Ten patients who underwent the brain 18F-FDG examination of PET/CT and PET/MR were selected randomly. The PET data were attenuation corrected by MRI-UTE and CT methods, and PETUTE and PETCT images were obtained. With the threshold segmentation method, the UET and CT attenuation correction maps(μ Maps) were segmented, and their differences in the neurocranium, brain tissue, and air were compared using paired t test. 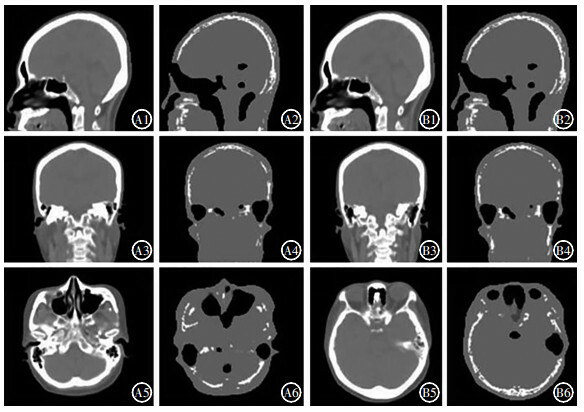 The difference between PETUTE and PETCT was analyzed by the statistical parametric map. Results A significant difference was found between the UTE_μ maps and CT_μ maps in the neurocranium (t=-23.45, P < 0.05) and air(t=5.29, P < 0.05). The difference rates were -64.8%±8.7% and 74.8%±44.7%, respectively. No significant difference(-1.5%±3.9%) in the brain tissue was found between the two maps (t=-1.24, P>0.05). The closer the brain was to the skull and the air, the more metabolism was reduced. Conclusions The UTE sequence can accurately evaluate the μ map of brain tissue, but there was a certain underestimation of PET quantitative analysis in areas close to skull and air area. Friston K. Introduction Experimental design and Statistical Parametric Mapping[J]. Human Brain Function, 2010, 4(6): 350–355. Chan TF, Vese LA. Active Contour Without Edges[J]. IEEE Trans Image Process, 2001, 10(2): 266–277.